My story about my son Leon Leighton Parker, I gave birth to him on the 07/08/13 we thought everything was fine to start off with and then he got taken down to neonatal because his temperature was down by .1 the hospital didn’t really know what was a matter to start off with. He went through many tests and scans and we found out his brain wasn’t developed properly and it all started coming together from there with his seizures and other symptoms. I remember the consultant calling a meeting with us all and then explaining that Leon had Zellweger syndrome and wouldn’t make it past 3 months. As time went on we was just living everyday like it was our last, 3 months came and went and neither the doctors or consultants had any idea. 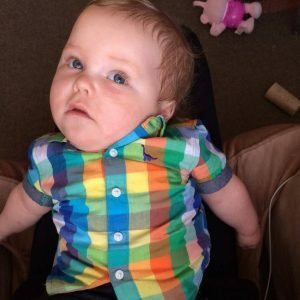 After more tests they then came back and said he had d-bifunctional protein deficiency and that he would not make it past 6 months, at 4 months old he had a cardiac arrest and didn’t have a heart beat for 24 minutes we thought this was it but the resus team was not going to give up they managed to get him back. He came back stronger then before, he was now feeding through his mouth, talking, crying and moving a lot more, it was like nothing would beat him. So at 6 months old we done him a birthday party as we then got told he wouldn’t make it past a year. It was such a brilliant day and Leon was getting excited most of the time we were there, it was brilliant to see everybody come together for his day. We still carried on after this day living each day like it was his last but sadly he got rushed into hospital 29th June 2014 with seizures that we couldn’t control and he ended up catching a chest infection whilst in there which then turned into pneumonia. He started struggling from there his right lunged collapsed and his left lung was filled with fluid. On the 5th July 2014 I had to ring all the family for them all to say there final goodbyes because he just wasn’t going to come back. We just sat watching his sats drop down, we had the choice of letting him have another cardiac arrest or for us to turn off the ventilator and do it our own way. So I decided to do that. The nurses were brilliant they took all his tubes and wires out and I was allowed to bath him, put him in fresh clothing whilst the nurses were breathing for him. One nurse got his footprints and the other cut a small section of his hair for us to keep, everybody got their cuddles and got to say goodbye. I held him in my arms and told him how proud I was and how happy he made me and that everybody thought he was a big strong boy and then I had to nod to the nurse to stop breathing for him and to let him go. I found it a lot easier because I was allowed to carry him down in my arms and got to put him into a bed tuck him and give him a kiss goodnight. It wasn’t like saying goodbye, it was just like any other night I put him to bed.